Hurricane Katrina brought the Mississippi Delta's deterioration into the public eye. Now researchers and policymakers are deciding how to restore the system. 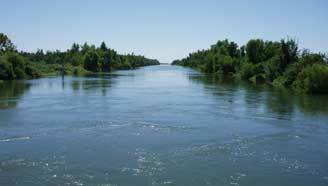 One answer seems clear: Return the delta region to a more natural ecosystem. A century ago, California's Salton Sea did not exist. A massive flood formed the sea, which 40 years ago was teeming with life. Today, the Salton Sea has come to a crossroads, its future clouded by the certainty of diminishing inflows, the impact of climate change and the challenges posed by its tremendous scale. Before humans recognized the importance of wetlands, they were indiscriminately destroyed. Today, thanks in part to new urban restoration efforts, urban wetlands are again serving as refuges in our cities. Geotimes Poll: Would you be willing to move your household if it meant that a large wetland ecosystem, such as the Mississippi Delta plain, could be restored? No more "snows of Kilimanjaro"? If you find something on your land — say a whole lot of a valuable building stone, a meteorite or a dinosaur bone— do you know what to do? Do you know who to contact to find out what it’s worth? If you don’t know what a PIO is, or don’t know who yours is, it might be worth your while to get to know him or her. PIOs are science writers, trained to take science jargon and make it readable. They are a scientist’s friend. Tibet faces its share of challenges, as the author realized during a recent trip to the area. Researchers are developing new and improved plans to restore U.S. wetlands and waterways, including the Salton Sea, pictured here. 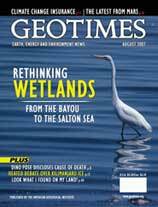 Read more about the Salton Sea and other waterways in this issue. Image is copyright of Milt Friend.